There have been plenty of examples of races ending under a safety car, red flag, or in a crash. 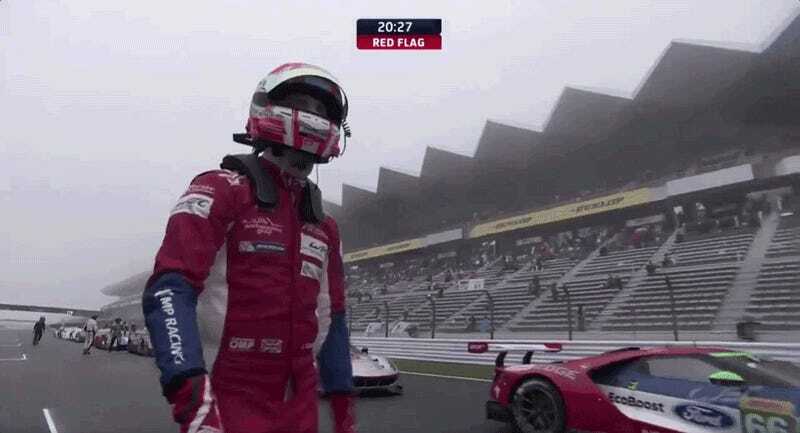 Yet somehow the World Endurance Championship’s 6 Hours of Fuji out-weirded them all. Drivers scrambled back to their cars to race for the final 10 minutes only to have the restart called off with everyone about to leave. What much of the race looked like. Screencap via WEC. WEC battled fog and rain all race long, with seven safety car periods and two lengthy red flags. The race started under a safety car and its first red flag came just over an hour in. It was truly the 6 Hours Of Can’t See Anything. At times, the pit lane wasn’t even visible from the grandstands across from it. The race ultimately had to be shortened, as WEC set a fixed time for the race to be over that couldn’t be moved. Conditions looked abysmal in the race’s final hour. The safety car went out on some exploratory laps to see if conditions were good to go, but many seemed to be packing it in. Toyota, whose cars were first and second overall, already celebrated the last red flag call, as it meant they probably wouldn’t have to fight off Porsche any more. They had been the stronger LMP1-class car in the rain, but the team expressed concern over their fuel situation on Twitter in the event of a brief restart. Then Race Control announced there would be ten more minutes of racing, taking everyone by surprise. A ten-minute restart here would have been like watching an endurance field go sprint racing in the wet. I’m a little disappointed it couldn’t happen, to be honest. At least one racer poo-pooed the idea of restarting: James Calado, whose No. 51 AF Corse Ferrari sat in the lead of LM GTE Pro after claiming it with in soaking wet conditions. Of course he didn’t want to fend off the Porsches in his class behind him anymore. Meanwhile, Porsche’s LMP1 drivers all but skipped to their cars at the chance to pass Toyota for the overall lead. They were extremely down for a restart. That restart never happened. Just as everyone was back in their cars and about to head back out on track, officials called it off. There would be no restart. Cars would circulate for one lap under the safety car and then head to parc fermé early. Conditions had worsened since the restart was called for. The race itself was surprisingly clean given the conditions, save for a big LMP2 crash as Jean-Éric Vergne and Mathias Beche collided and the then-LM GTE Pro-leading No. 92 Porsche 911 RSR getting tapped out of position by the No. 67 Ford GT trying to unlap himself. Karma (or more accurately, what happens when you’re pushing too hard) caught up to No. 67 driver Andy Priaulx shortly afterwards as he went off and got beached in the gravel. When the final restart was called off, it gave Toyota the perfect result for their home race. Not only did it keep their No. 8 TS050 in the championship hunt, but Porsche’s championship-leading No. 2 car didn’t even make the podium, finishing fourth. This is Toyota’s first victory since the 6 Hours of Spa in May. That winning No. 8 car only made 115 laps during the race, which is an absurdly short distance. Some drivers, including Toyota’s Anthony Davidson, didn’t even have time to drive before the race ending was called off. Calado got to keep his first place position in LM GTE Pro, with the No. 51 AF Corse Ferrari 488 GTE being declared the winner in its class. The No. 31 Vaillante Rebellion won in LMP2, and the No. 54 Spirit of Race Ferrari 488 GTE took the LM GTE Am win.